David B. Allen, 54, Hot Air Balloon Pilot of Media, died Oct. 4th at Brandywine Hospital in Chester County. Mr. Allen was born in Springfield. He was a 1971 graduate of Marple Newtown High School where he played football. 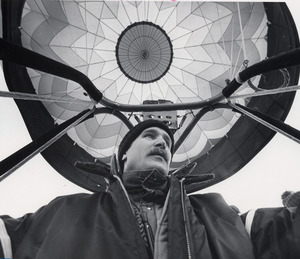 A fifth generation hot air balloon pilot, Mr. Allen owned and operated Magical Mystery Flights. He joined in the spirit of occasions celebrated by his customers, once calling out, "There's no place like home!" as he launched a flight for the 70th birthday of a woman whose family had adopted a "Wizard of Oz" theme for the event. Mr. Allen was a member and cantor at Nativity of the Blessed Virgin Mary Church in Media. An avid motorcyclist and member of the American Motorcylist Association, he traveled to 40 of the United States and in Europe. Mr. Allen was known as a good storyteller who had a zest for life. Survivors: Wife, Janet Weyhmuller Allen; daughter, Alaina Allen of Media; father, Edward B. Allen of Media; brothers, Ted Allen of Estes Park, CO., George Allen of Phoenix, AZ., Michael Allen of Colorado Springs, CO., nieces; nephews. Mass: 10AM Tuesday, Nativity of the Blessed Virgin Mary Church, Franklin and Monroe streets, Media. Burial: Arlington Cemetery, Drexel Hill, PA. Contributions: Make-A-Wish Foundation, One Valley Square, 512 Township Line Road, Suite 133, Blue Bell, PA. 19422. Please share your memories of David.